Do you currently use Medical software? Driven by the Health Information Technology for Economic and Clinical Health Act (otherwise known as the HITECH Act), adoption of medical software is soaring across United States healthcare. The HITECH Act set aside over $25 billion to encourage the adoption and expansion healthcare IT. The Meaningful Use program, for instance, offers significant subsidies should providers adopt electronic medical records and meet a set of standards set forth by the Centers for Medicare and Medicaid. Results were initially slow, but judging by pure adoption numbers the program has succeeded. In 2014, the National Center for Healthcare Statistics released a report showing that 78 percent of office-based physicians had adopted electronic medical records, although this number is contradicted by other reports, such as research firm SK&A’s finding that adoption is closer to 61 percent. Paper documents are quickly becoming an anachronism in healthcare, and care providers are now scrambling to find the best medical software for their practice, whether it be an EHR system or something more localized. However, the HITECH Act isn’t the only influence moving providers to invest in greater information technology: patients are increasingly demanding more intuitive means to interact with their healthcare providers, as well as greater access to their health information. Other major industries have already acquiesced to such demands from consumers. The financial, insurance, and telecom markets all instituted electronic delivery services for their consumers some 20 years ago. Additionally, new care models, such as patient centered medical homes and accountable care organizations, require a significant IT infrastructure to transfer critical data between providers, patients, and payers. Several types of software preceded the electronic medical record, most notably practice management and billing software. This guide helps providers **compare medical software** by examining each of these three types, detailing the benefits, and explaining current trends prospective buyers should be aware of. Before the HITECH Act, the EHR – a term used synonymously with EMR by the vast majority of healthcare professionals – was used more often as a research tool, with few hospitals and practices storing clinical patient information electronically. Now, providers are implementing EHRs at a rapid rate, many in hopes of meeting Meaningful Use criteria and qualifying for federal incentives to cover the cost of buying the software. However, despite a recent Health Affairs systematic review that found 92 percent of published papers correlated with positive conclusions about EHR usage, many physicians remain unsatisfied with their EHR systems. This partially results from the plethora of vendors that entered the market after the HITECH Act was passed, many of which offered substandard products. This number has decreased substantially as Meaningful Use standards have become more stringent, but finding a system that’s both usable and powerful still presents a challenge. A basic, quality electronic health record system should be able to record SOAP notes, transfer prescriptions to pharmacists using computerized physician order entry, allow providers to chart without significant impediment, help physicians check treatment recommendations against problem and medication lists, and offer some type of information transfer between different systems. Many systems promise this type of functionality, but fall short once they’re implemented. Two types of certification exist to help buyers better choose quality software: CMS’s ONC-ATB certification and the CCHIT certification, which is more demanding than CMS standards. 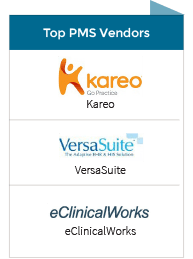 Which Medical software is right for your practice? As the medical software market matures, more EHRs are being offered through remotely hosted deployments rather than via on-premise, dedicated servers. While not necessarily cheaper, cloud-based EHRs are usually easier to deploy and maintain, as vendors are responsible for software updates and server maintenance. Though adoption rates are increasing rapidly, many of the early adopters have been primary care physicians who were the target market for many first generation EHRs. As more specialists adopt EHRs, it’s important to consider how a system’s capabilities align with your clinical workflow. Specialty specific templates or customizable templates are important characteristics to look for in a specialty-facing system. The electronic medical records market is complex, as is the purchasing process. 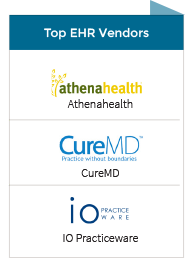 If you’re looking for more information on EHR software, see our comprehensive EHR listings, or read our free EHR buyer’s guide. While electronic medical records deal with clinical information at the point of care, practice management software will often organize other aspects of the clinical workflow, such as appointments, room assignments, billing, and even inventory. Due to its direct connection with billing and coding, practice management software was already adopted by many physicians before electronic medical records. 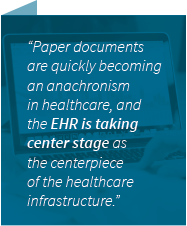 While physicians could still practice with paper patient records in the past – often because patients didn’t expect as much information access as they do today and the CMS wasn’t pushing for EHR adoption – providers couldn’t maintain their entire revenue cycle through paper means. Like EHRs, practice management systems can cover a great deal of functionality. Some simply handle appointments, while others can boast functions that allow the system to accept information from radiology and laboratory systems. More commonly, a strong financial element exists, and practice management systems are often used to conduct payroll and produce reports that examine administrative costs and practice profit versus overhead. Practice management software also often helps physicians with billing, and some vendors offer completely outsourced services, which works well for smaller practices that don’t want to hire additional staff to handle finances. Though the deadline for transitioning to the new set of procedure codes has been pushed back to October 2015, providers would do well to begin preparing as soon as possible, as the new code set is significantly larger and more complex than ICD-9. Choosing a practice management system that features coding assistance in ICD-10, or updating your current system to meet the new standard, is critical to ensure your revenue cycle continues running smoothly. Practice management systems come in two forms: connected to an electronic health record system or a standalone version not tied to an EHR. When selecting products, it’s important to consider the overall usability and functionality of a system, but integration with an EHR can be a significant benefit. If the two systems don’t interface, you may have to contact one of the two vendors and request technical support, which could lead to lost data. For more information on practice management systems, see our complete vendor listings or read our comprehensive guide. A subset of practice management software, standalone billing software helps providers transition from manually submitting claims using paper records and fax machines, to automating the process with software. Though practice management systems, electronic health record systems, and billing systems are all moving toward integration, you can still purchase stand-alone versions of each. Like the other two types of software, billing software ranges in complexity depending on the specific product. The reduction in clerical errors is self-explanatory: without having to maintain mountains of paper files, organizing information becomes easier. More accurate billing results in increased revenue and decreased denials, as well as reports that can help identify patterns in upcoding. Using such reports, providers can determine which procedures they can upcode and which payers will accept upcoding. Finally, gaining greater control over your revenue cycle leads to faster claim submission and greater accuracy. The trends in medical billing software overlap with those of practice management, namely ICD-10 support and the ongoing move towards integration with EHRs. 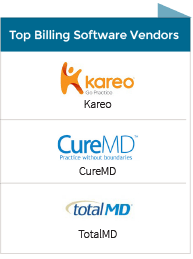 For more information about medical billing software, see our complete vendor listings, or read our comprehensive guide.